Edwin Landseer, Portrait of a Terrier, The Property of Owen Williams, ESQ., M.P. (Jocko with a Hedgehog), 1828. Gift of Erwin C. Uihlein. Photo by Larry Sanders. This week is National Dog Week – and what better Museum dweller to highlight than brave Jocko (and his unfortunate companion, the hedgehog) in honor of this important holiday? 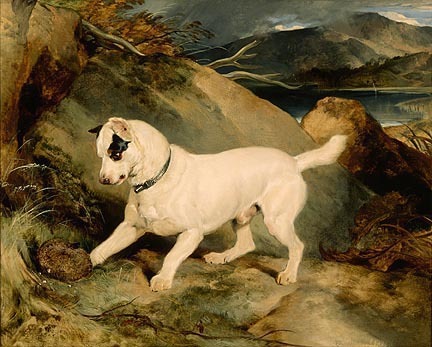 Edwin Landseer was just 26 years old when he painted this work for Owen Williams, Jocko’s owner. Before the age of digital cameras, the only way to honor the image of your beloved four-legged companion was in oil on canvas, and Landseer was the best painter of pet portraiture in the early 1800s. Wildly popular, Landseer even gave drawing lessons to Queen Victoria. The real proof of his fame, however, might be in the price: in 1874, the year after his death, Landseer’s oil sketches cost anywhere from £15 to £550—that’s around £685 to £25,000 in today’s currency (thanks to the UK National Archives), or in American dollars, $1,000 to $39,000. This entry was posted in Art and tagged 19th Century Art, Edwin Landseer, From the Collection. Bookmark the permalink.